Galaxy was one of the first pulps to explicitly bill itself as a magazine for "adults," in 1950 under founding editor HL Gold. I grew up on Galaxy, buying old issues for a quarter from the sale rack outside of Bakka, Toronto's stalwart sf bookstore. Later, I studied under Kate Wilhelm, who told uproarious stories about editing the magazine under Fred Pohl -- I also spent a couple entertaining evenings getting Pohl's version of these stories. 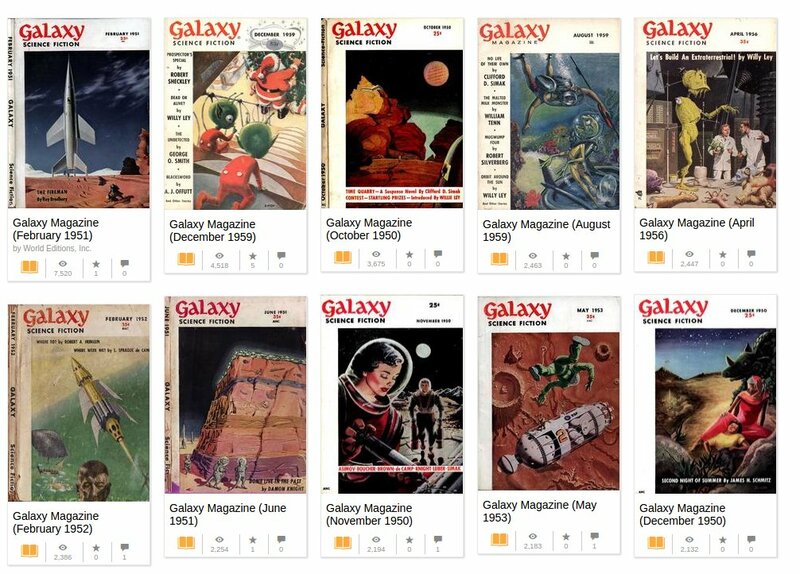 The Internet Archive has nearly the entire run of Galaxy for your perusal, with classic stories by Le Guin, Cherryh, Heinlein, Bradbury, Asimov, Bester, and other pioneers. Also available is most of IF, Galaxy's sister magazine.